Greetings Ashland! 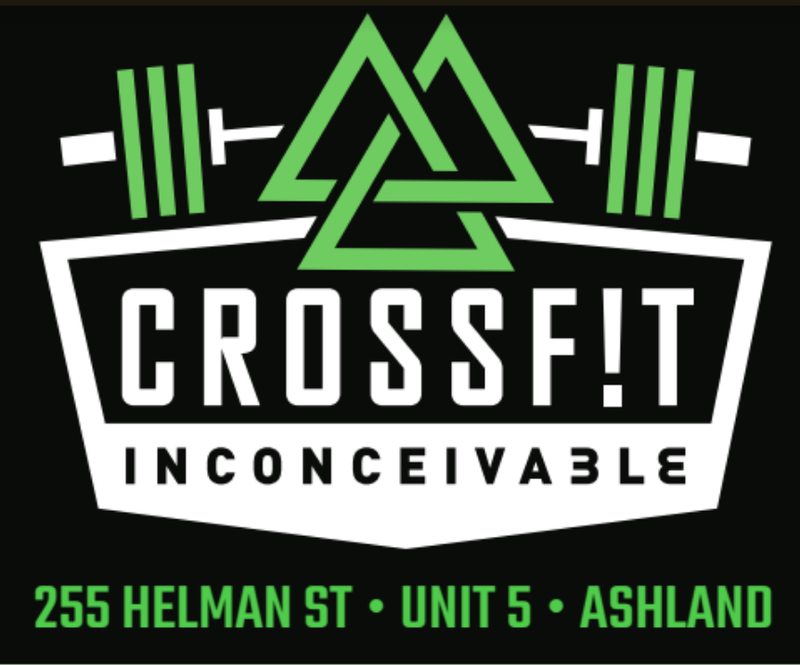 We are excited to introduce CrossFit Inconceivable – a community dedicated to health and fitness for all. Playfully named for a famous phrase from the movie Princess Bride, we hope to open the conversation about what CrossFit can mean for you, your family and this community – true love for fitness, experiencing and achieving beyond what you ever thought possible! Upon our arrival in Ashland two years ago from Michigan, we were impressed by the global dedication to physical activity and fortunate to find CrossFit in our neighborhood, offering us opportunity to challenge our athletic capacity and embrace exercise in a group setting. In September, we took over the space formerly occupied by Aretè CrossFit and launched our new affiliate CrossFit Inconceivable, with a mission of finding the best health for self, family and community along the journey toward fitness. Inspired by Amelia’s work as an osteopathic physician, we are committed to promoting health of body, mind and spirit. Through our experience with CrossFit, we have found common principles including quality nutrition, exercise and stress management – a true complement of these two aspects of Amelia’s professional life – physician and coach. In our busy lives as working parents with three young children, particularly after the challenging smoke-season, we recognize the need for safe, indoor recreation, welcoming to the whole family and have designed a space to meet these needs. We also realize time is precious and have found efficiency in the one-hour workouts, complete with warm-up, coaching, exertion. CrossFit has helped us increase mobility, improved our power, speed and endurance while supporting our outside athletic endeavors in soccer, triathlon and rowing. We have achieved PRs in our races through this training including qualification to represent Team USA in the Long Course Triathlon World Championships. At CrossFit Inconceivable, we have members from 4 to 74 years old working together in the same space, utilizing similar movements and modifying workouts to meet individual needs. Our enthusiastic and energetic community will encourage you every day to perform your personal best. Drawing on experience from weightlifting, endurance sports, outdoor adventure, wildland firefighting, gymnastics and more, our skilled coaches will work with you to achieve your goals from the tasks of daily life to athletic endeavors. Check out our website at www.crossfitinconceivable.com or join us for a FREE INTRODUCTORY class at 255 Helman Street (on the corner of Helman and Hersey) Saturday at 10am or Thursday at 6:30pm and look for our interview in the December issue of Locals Guide. We hope you will join with us as we energize, empower and evolve at CrossFit Inconceivable. Thank you, Ashland, for the warm welcome these past two years – we are honored to have the opportunity to join with all of you on the journey toward the best health of this fantastic community!